Our potential for economic growth is limited by the world’s finite resources. Most forecasting models incorrectly assume endless growth. However, the laws of physics will not be defied by economics. 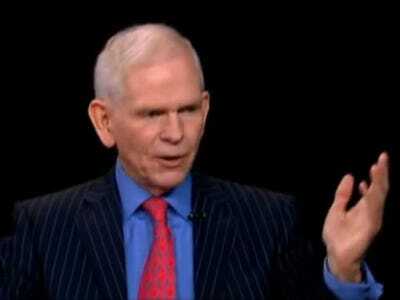 These are the main takeaways from the latest investor letter by GMO’s Jeremy Grantham. Over the last few months, the price of oil has tumbled from well north of $US100 to below $US80. Some would say this is likely to result is cheaper gas prices, serving as a boon for the US consumer and potentially US corporations. However, these forecasts are short-sighted. 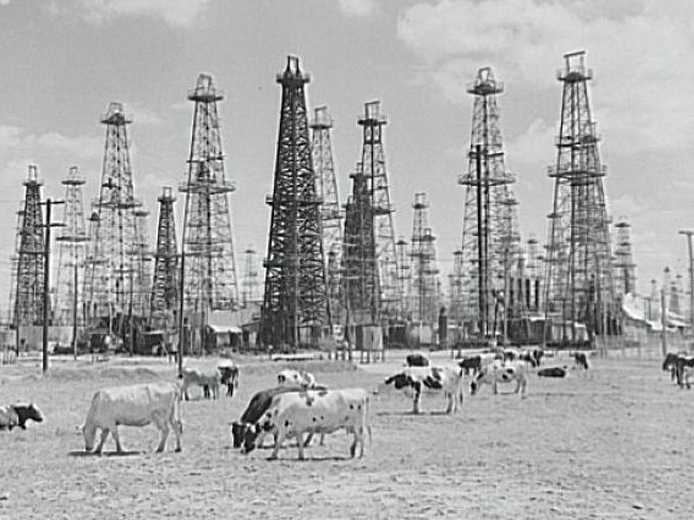 Grantham looks at oil from a far broad perspective, unpacking the commodity’s role in the last 150 or so years of economic development and arguing that the serial mispricing and misallocation of oil has lead us to a place where oil’s cost has, and will, continue to hamper potential economic growth. “We assume the oil or coal, our finite and amazing inheritance, is free and price it just at its extraction cost plus a profit margin,” Grantham writes. And by treating this finite resource as something infinite, Grantham says we have ignored the second law of thermodynamics: that entropy increases over time as the energy in a system dissipates. And so under this framework, Grantham sees the increasingly globalized economy not as a system that is compounding to become more potent, but that is, rather, converging towards increased impotency. Library Of CongressOil has been crucal for the growth in the 20th century. 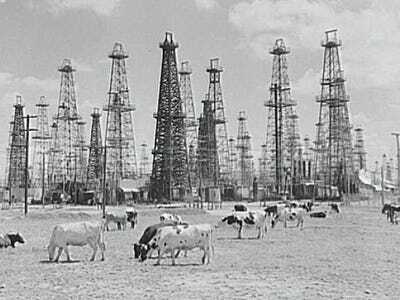 For about 100 years, from 1870 to 1970, the price of oil was roughly pegged at about $US16 a barrel in today’s currency. Over this period, though, Americans became six times richer and therefore could handle the very substantial increases in energy witnessed over the last 30 or 40 years, driving up the size and complexity of our economic system. This is what Grantham refers to as the “economic surplus” we enjoyed with respect to oil: since oil costs remained so low as a percentage of our earnings we failed to realise how much we’d come depend on that benefit. 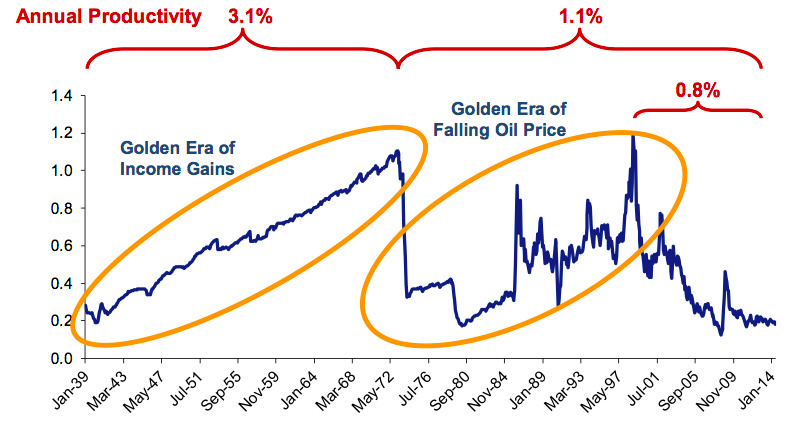 And Grantham doesn’t see these expected productivity rates coming back. 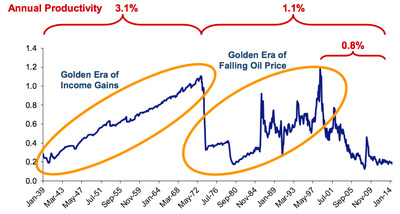 When Grantham writes about the amount of oil the amount of oil the average American worker can buy with one hour’s wages, this is the chart he references. This is a somewhat convoluted chart, and again, the text that accompanies it is only more dense, but the idea that Grantham is driving at here is that the more expensive oil becomes relative to our earnings, the less oil benefits us economically. And so currently, the average worker’s earnings buy about 20% of a barrel of oil, roughly what they did in 1940 before the huge manufacturing boom that made the US the global economic superpower of the 20th century. For Grantham, this chart shows, “a remarkable round trip and what a lot it says about the preeminence of oil in our economy. When oil was becoming more affordable up to 1972 and oil intensity per person was still increasing, productivity per man hour grew at an unprecedented rate of 3.1% a year. And so the upshot here is that as oil got not just nominally but relatively more expensive, this cost ate into our productivity not just in the near-term but over the long-term. In the last ten years, the US has enjoyed an “energy renaissance” courtesy of the fracking boom that has taken hold in places like Texas and North Dakota. But Grantham isn’t sold on this “boom’s” robustness. 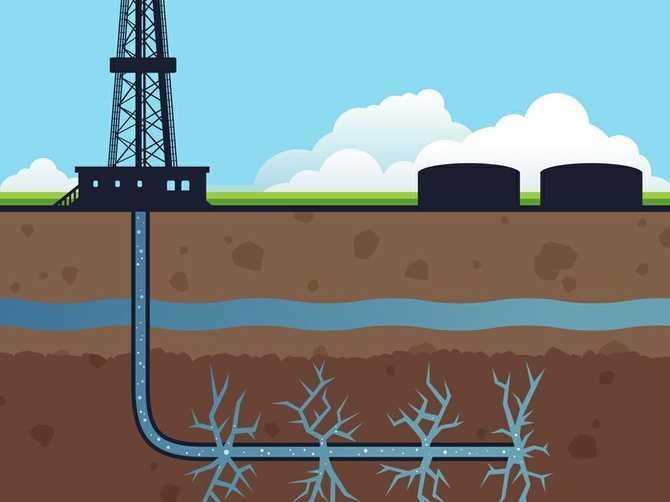 “First, let us quickly admit that U.S. fracking is a very large herring,” Grantham writes. Process Industry Forum via Google ImagesHorizontal drilling and hydraulic fracking have been technological gamechangers. Grantham writes that there are few regulations regarding fracking, which has given the US an advantage over other potential projects, and nearly 100% of the global oil production over the last eight years has been due to fracking. But for Grantham, the “red herring-ness” of fracking comes it what it hasn’t done. This gloomy outlook is not new for Grantham. For years, Grantham has been considered a ‘Malthusian,’ which is basically the worldview that the number of people will overrun the amount of resources on Earth available to sustain the population. And his most recent outlook sees him reiterate this view, but this time with a specific eye towards the economics establishment and the logical fallacy of the core assumption underwriting modern economic thought. “[T]he economic mainstream has totally missed the significance of the limits on growth posed by finite resources and again marginalized the work of Kenneth Boulding and Nicholas Georgescu-Roegen and the writers of the original ‘The Limits to Growth,’ who did,” Grantham writes. And so again, all in, Grantham hammers on themes he has discussed at length in the past: dwindling resources, dim prospects for future growth, and the flaws of our economic frameworks. You can read the whole GMO letter here, and while Grantham’s writing is extremely dense, and you may not agree with some (or any) of his ideas, he challenges received wisdoms and is worth spending some time with.